Food, glorious food! Who doesn’t love it? It’s not just the taste of food, although, that is great. Food brings people together. There is something so meaningful about spending time with those you love, and enjoying a meal or a coffee together. 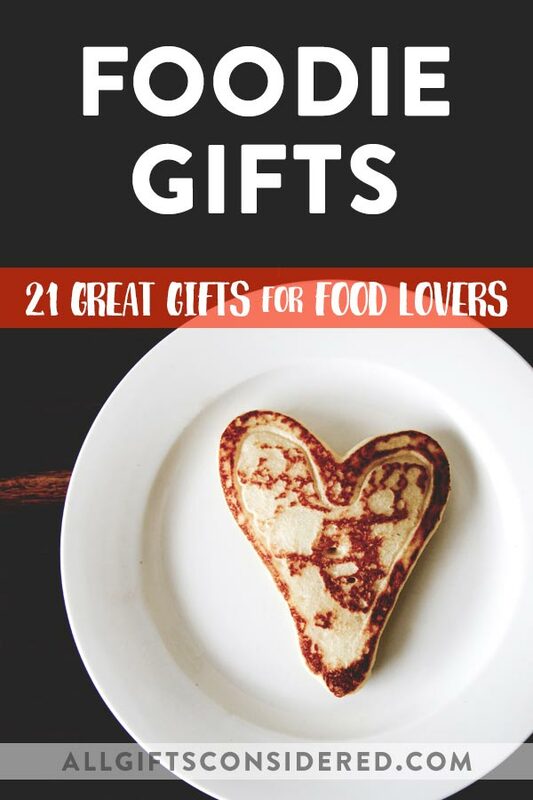 If you are looking for unique gift ideas for that foodie or chef in your life look no further. Coming from a fellow food lover, I hope this list will give you some great ideas for foodie gifts that they will truly savor. Here’s what we have in store for you…. Please note that this post contains affiliate links. All righty, let’s go! These kitchen gifts and accessories are perfect for giving to the food enthusiast in your life who loves to cook. Excuse me while I wipe away my drool. Do you or someone you know love sushi? Sorry, gotta wipe the drool again. Hang on, I’m going to order some sushi real quick. And a napkin. Ok I’m back. Now you – or your foodie friend, but let’s be honest, it’s you – can have everything you need to make it from home with this sushi making kit. 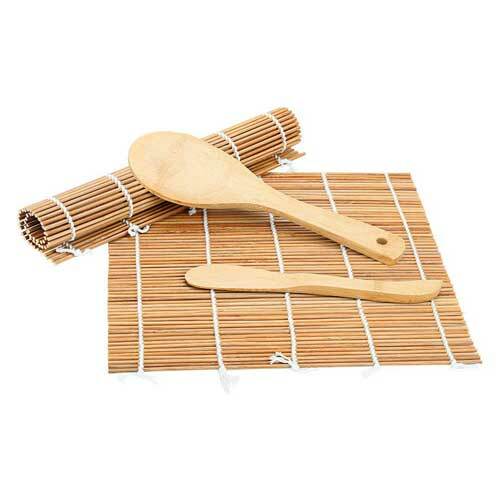 It comes complete with bamboo rolling mats and chopsticks. We have started making sushi at home, and it is delicious! You can add any filling you like, and – bonus! – you can eat it at home in your pajamas. Pair this sushi set in a gift basket with rice, seaweed wraps, and tons of fillings and you’ll have an unforgettable foodie gift. 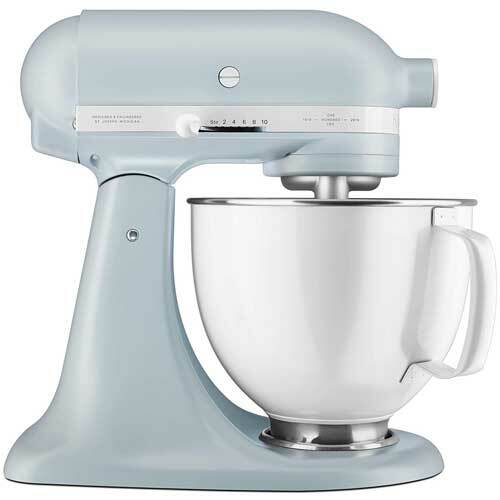 If you REALLY love a foodie, maybe consider buying them this mixer. 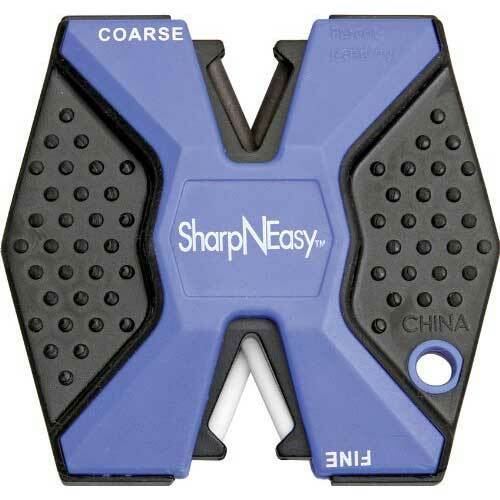 I received one of these little knife sharpeners as a Christmas gift, and they work extremely well! I had some really dull knives, which is no bueno, and a few swipes on this baby and they cut like a dream. These sharpeners are also really small, so you can stash them anywhere. I got mine as a stocking stuffer, FWIW. 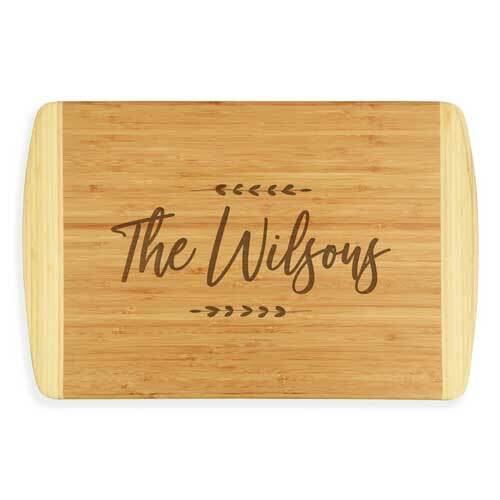 Chop those veggies in style with your very own personalized bamboo cutting board. This would also make a great housewarming gift, and it’s perfect for a wedding as well. You could even leave it out on display and it will add a custom touch of charm to your kitchen decor. Mole, mole mole, guacamole. 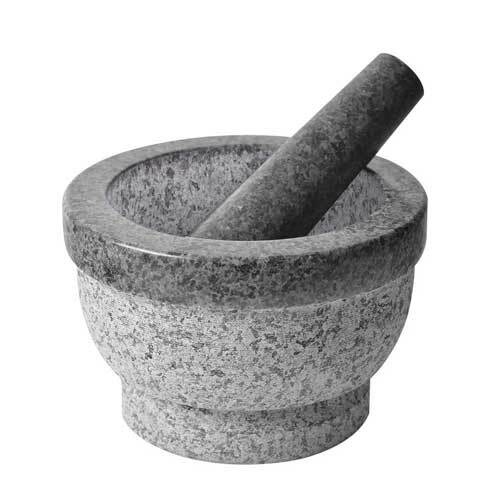 This large granite mortar and pestle can hold 2 cups, so it is perfect for making big batches of guacamole or any other yummy dip. There is something so cool about grinding up spices and dips and things in one of these. You feel like you are living in The Little House on the Prairie. It’s the best sort of feeling for a foodie. Give ’em to me baby, uh-huh, uh-huh! Pretty fly for some white knives. 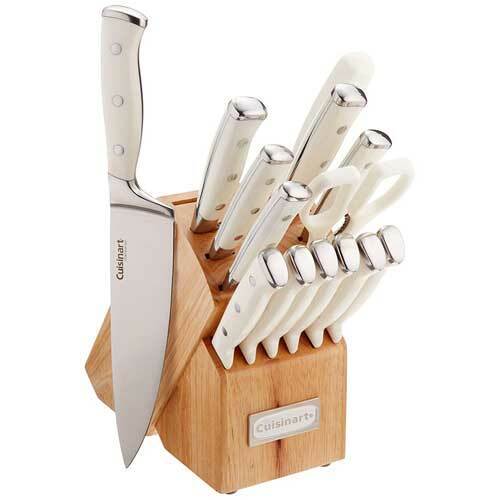 This Cuisinart knife set is so pretty. The 15 piece set comes with every knife you could ever need. 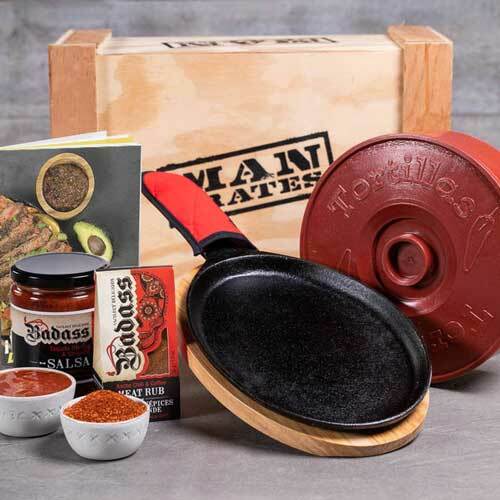 This would make a great gift for the foodie who loves to cook. Good knives are a must. These personal sized NutriBullet blender systems are super cool. Nobody has time to mess with a big old blender all the time, just to whip up a little smoothie. 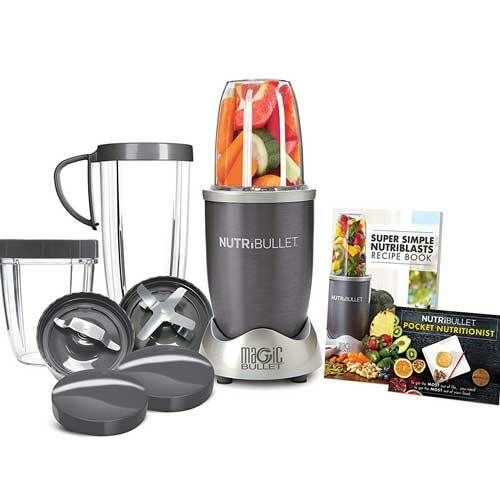 These blenders pack a punch for their small size, and the set comes with everything you need to make smoothies to go. This pepper grinder may not be much to look at, but I have one and I adore it. 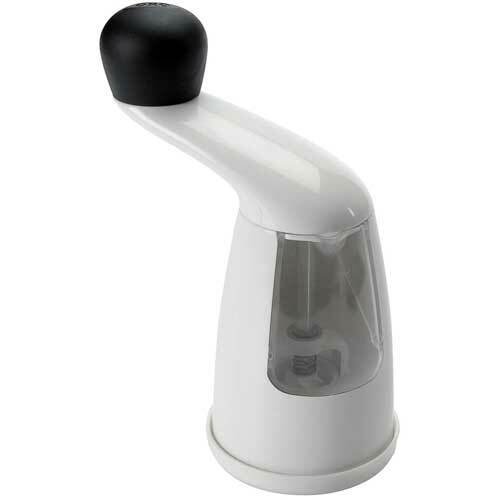 It grinds so smoothly, with adjustable grind size. It also has a little door that easily opens to refill. Sometimes it’s the little things that make for a surprisingly great foodie gift. Nothing beats freshly ground pepper, let me tell ya. Here we have some creative, quirky, and personalized gifts for foodies. These are perfect for birthdays, holidays, and other special occasions. I am a firm believer that these insulated tumblers are the best thing since sliced turkey. These mugs include custom engraving, which makes them a great gift idea. What’s more, they keep smoothies and iced tea cold for hours on end. For winter, they keep hot drinks like coffee and uh, adult hot chocolate steaming for as long as it takes to reach the last sip. 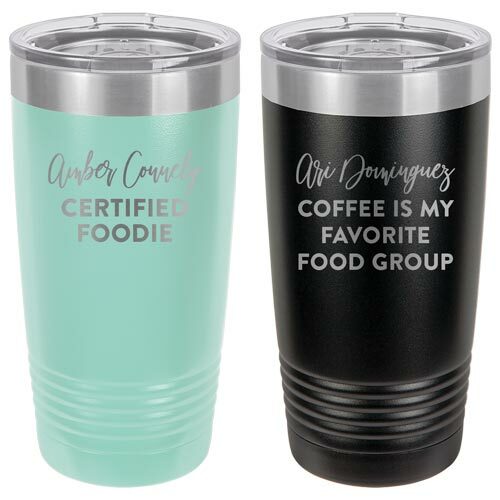 Foodies love smoothies and specialty beverages, so what better gift than a personalized tumbler they can take anywhere! Hehe, these are so cute. 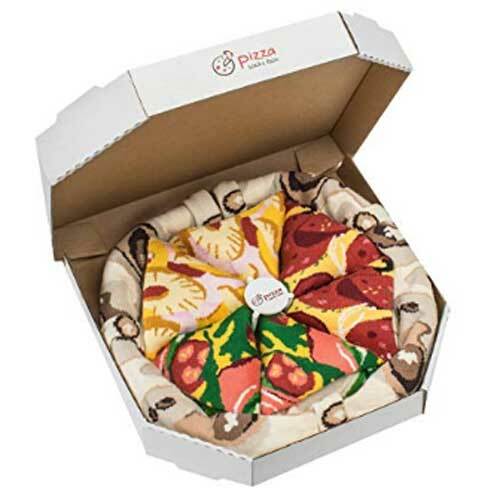 Not only are these pizza print socks, but they come in a pizza box, and folded to look like a pizza. If pizza is one of your love languages these socks will hit the spot. Whether you just really love your food, or are straight up hipster, you never have to be without your Sriracha again. 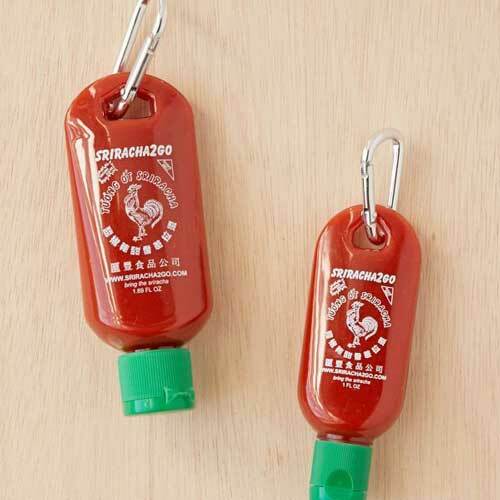 These Sriracha bottle keychains are easy to fill and keep with you at all times. This is one hot gift! Like, red hot, ya know? If you love straws, but also want to eliminate the use of plastic, these stainless steel straws are perfect for you. We all want to do our little part to care for the environment, but straws are just so nice! So go with some reusable metal straws and you get the best of both worlds. 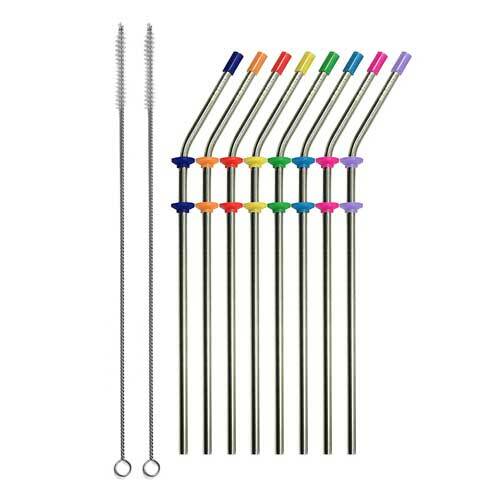 This is a set of 8 stainless steel straws. The set also comes with little pop on silicone tips for comfortable sippage, and cleaners, which are, you know, important. Need. This. Shirt. And more salt. Once again, I am a salt addict. Give it to me piled high. 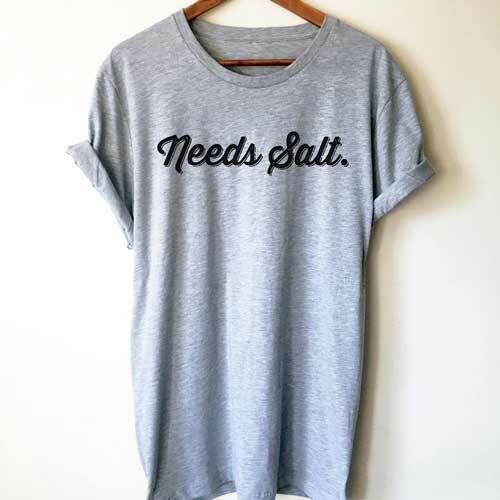 If you know a fellow salty food lover this Needs Salt t-shirt is perfect for them. Anyone that has ever used a coaster knows there are a lot of tacky ones out there. For real, bro. 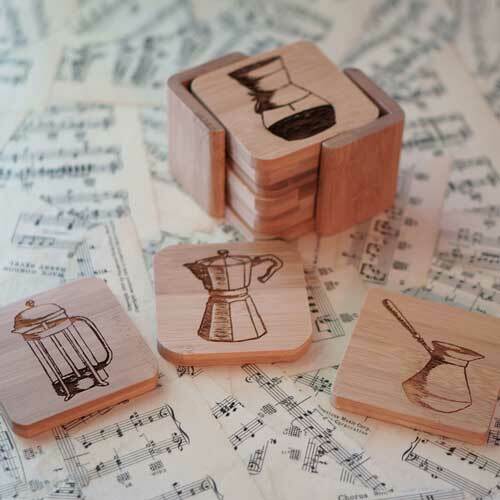 This set of six bamboo coffee art coasters are actually stylin’. The designs are hand drawn, and the coasters themselves are natural and chic. 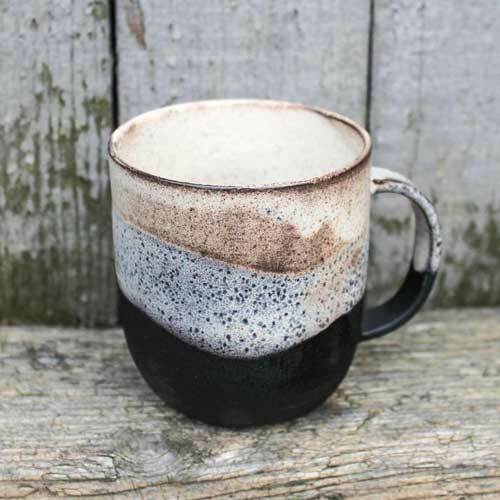 Unique mugs make the best gifts, and these handmade artisan ceramic mugs are just lovely. They have several different colors and designs, and they all would look great mixed and matched. Imagine a steaming cup of coffee in that beauty. Now that is a gift to savor! What better foodie gift could there be other than food? The options for delicious food items and baskets are nearly endless, but any of these will offer some real pizazz. Yum! If you are like me you like to jazz up your popcorn with fun combinations of flavor. 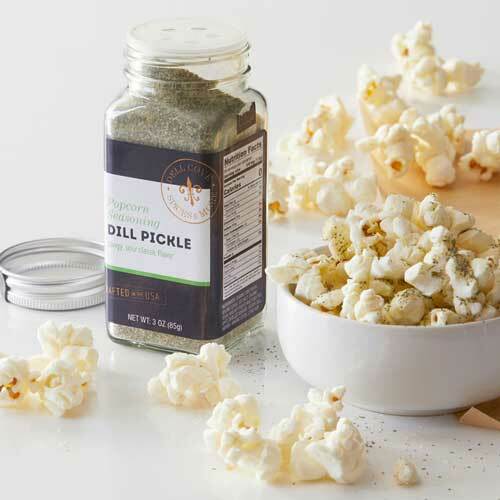 These gourmet popcorn seasonings look delicious. You can pick 4 different seasonings from a long list that includes seasonings like thai sriracha, buffalo wings and buttered rum. I basically want to try them all. If you love a foodie these would make a great gift. Maybe combine it with a movie and a bag of popcorn for movie night? I’m in! If you are like me you wish you had the greenest of thumbs, but there ain’t nothin’ green about ’em. Some of us need a little assistance. 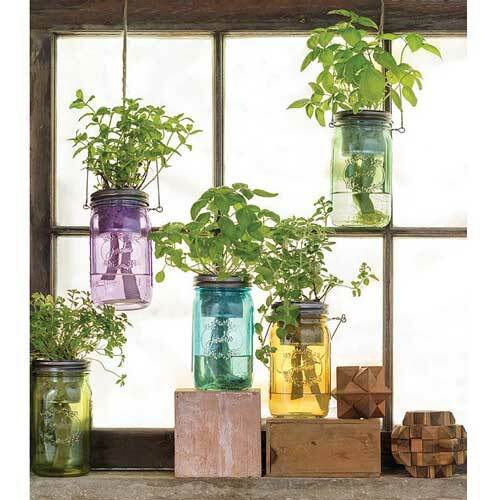 These cool Mason jar hydroponic herb gardens seem to make growing your own herbs easy-peasy. You can choose from different herbs like cilantro, parsley, and more, and grow them year-round. Plus they look so cute! Yum, olive oil! 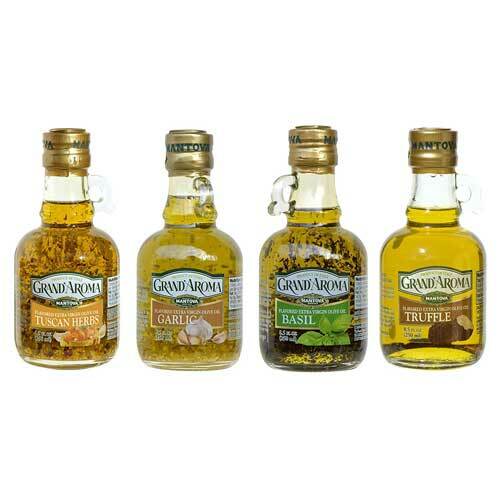 And not only that but a variety of flavor infused olive oils. Tuscan herb, garlic, basil, truffle…. these all sound delicious! This set would make a great gift for the chef or food lover in your life. Flavor infused olive oils are perfect for serving as a bread dip, adding a little panache to your meal. Get in my belly! 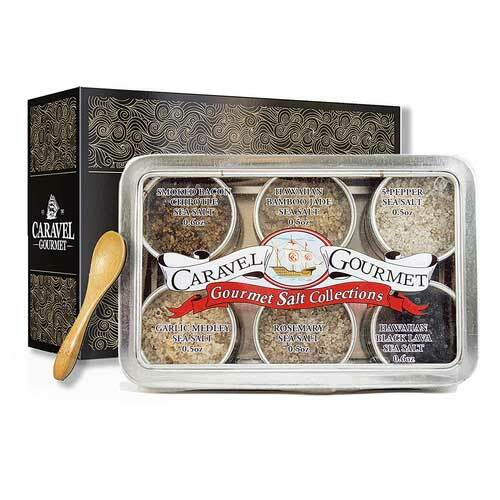 I am a self proclaimed salt addict, and this gourmet salt collection has me jonesing. Every flavor sounds perfect (Smoked Bacon Chipotle, anyone?! ), and it even comes with a cute little wooden spoon. Foodie gift boxes are just like they sound: little boxes that you give to a foodie, filled with amazing and unique delicacies to enjoy. Here are two of our favorites. Harry and David makes some delicious food. I mean, super yummy. 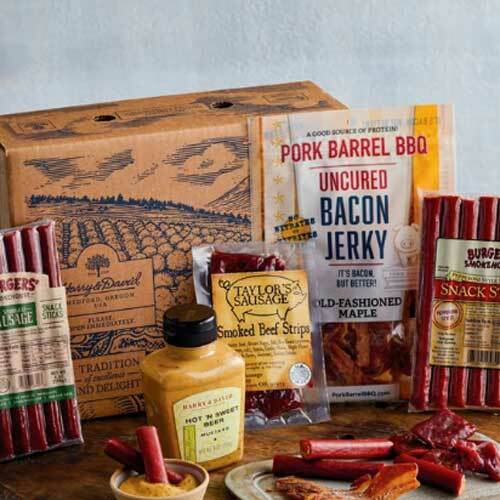 This jerky gift set has a smattering of different meats and a beer mustard to go along with it. I am also a little partial to Harry and David because they started in Oregon, where I was born and raised. Did I mention their stuff is delicious? Just looking at this foodie gift box makes me hear little mariachi band music go off in my head, and gives me a mad craving for some fajitas! How about you? Now I have a wonderful list of amazing things I would like to add to my home. I also now have a mad sushi and coffee craving! Weird how that works. 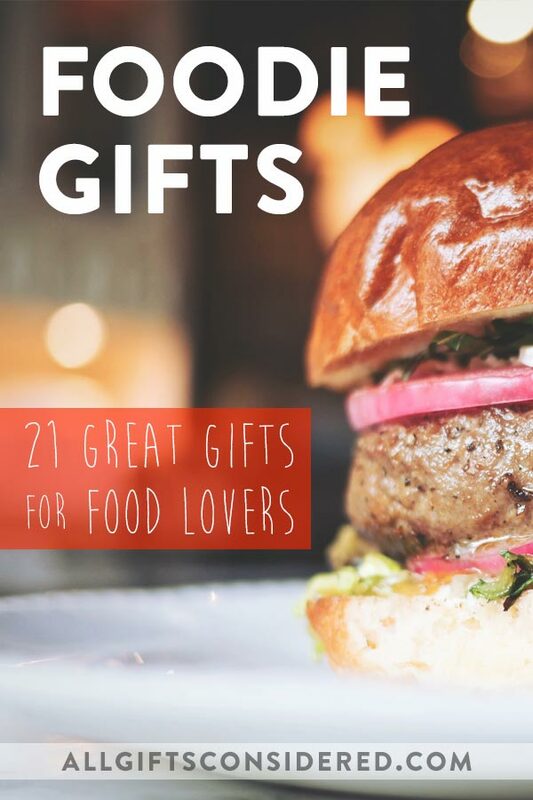 I hope this list of foodie gifts has sparked your taste buds and imagination as well. If you need further inspiration for the food lover in our life, check out these 17 must-have kitchen accessories that are actually brilliant gift ideas. And of course you’ll always find something great to personalize at Northwest Gifts, check it out! What do a slice of pizza, a baked potato, and a banana have in common?